Recently I wanted an organic barbecue sauce for chicken and we used to like a store-bought kind, but those days are over since it has high fructose corn syrup (heart-killer ingredient), just like all store-bought sauces do. We've tried an organic barbecue sauce at the health food store and didn't like it. So I made up my own with help from my friend, Nancy! Mix together in a saucepan and simmer for 5-10 minutes. This makes a lot of sauce, you may want to halve the recipe. Mix it up well, do lots of taste testing and play around with it until you like it. The recipe isn't exact, play with it and see how you like it! I am uncomfortable with “liquid smoke” flavors etc. I saw a documentary a while back on how they are made. Try finding it on you tube. Nancy, even if the ingredients are okay? I’ll look for it. Thanks! I loved this BBQ sauce. I don’t plan to buy BBQ sauce again. I didn’t have liquid smoke and because of food allergies in the family I wasn’t able to use the Soy Sauce. Instead I used 1 1/2 t smoked paprika and added a little garlic powder. It was amazing! Yum! And I’ll bet smoked paprika and/or chipotle chili powder (which is hot) would add a nice smoky flavor too. Okay I got a suggestion for ya instead of liquid smoke, use a smoked salt. There are many that are just salt that has been smoked. Avoid cheep brands for they will have additives. @Chris, where do you get it? At stores or only online? That sounds super yummy Ashley!! I just made this for my daughter’s b-day party yesterday, to accompany shredded pork sandwiches. I set out this sauce, along with a bottle of Sweet Baby Ray’s & it went over really well. Most people seemed to initially reach for the familiar, SBR’s, but once I convinced them to try the homemade sauce, everyone that tried it said it was good. I made it exactly as written, using Annie’s organic ketchup, raw apple cider vinegar & raw honey as the sweetener. Personally, I like it even better than SBR’s because it’s not so sickening sweet! I make my own bbq sauce, too, after reading labels on all my previous favorite brands. I make my sauce with Heinz Organic Ketchup, organic unsulphered molasses, liquid smoke, and a few shakes of organic garlic powder. The molasses is what makes mine stickier and richer in flavor, like the name brands only without the hfcs. I’d give you amounts, but I never measure, just do it by taste. The ingredients are listed in descending order. I’m not sure what’s in the liquid smoke, but all the other ingredients are natural. I’m not much of an “experimenter” in the kitchen, but I took your advice and just threw the ingredients together, adjusted to my liking, and it’s great!! Thanks for the recipe. It’s impossible to find a bbq sauce without HFCS locally, so this will do perfectly! Hi, Love your recipes! Just wanted to share how I make Bar B Q sauce for my husband who, since getting on nat. and healthy food and a few good supplements, etc., and walking, is controlling his diabetes without meds, after being on them for many yrs, not to his advantage. Like you, I couldn’t find a Bar B Q sauce that didn’t have HFCS, or just CS, and/or MSG, etc. I won’t give the exact amts. here, can easily be figured out as you go, I think. I start with lightly chopping in blender-a little org. sweet onion and bell pepper & bit of garlic [or use just a bit of org. garlic powder] saute them in a little EV Oil, add org. Tomato paste, water, org. mustard, just a bit of org. Molasses, org., little Palm Sugar, org. Worshestershire, & touch of org. lite soy or tamari, touch lemon juice, Himalayan [American Blue-Green co.] or Pink salt, black pepper, dash hot sauce, enough Nat. Hickory Smoke to give a smoked taste/flavor/aroma, and cook, simmering for about 20 min, at last add non-bitter Stevia to sweeten accord. to taste. We only use the brand NuNaturals Stevia. Most tend to be bitter, [but perhaps there are more brands now making the non-bitter type]. I then pour it into jars with lids that will seal, place them in water bath, but do not need to cover, just bring water to a boil about 15 min. or more, then let jars cool and set. They keep great, tho I do keep the unopened jars in refrig.- sealed- just in case. This may sound lengthy & complicated- but really isn’t. And it’s so good to know we’re not having to settle with the junk. Oh, sometimes I also use Xylitol to ‘cut’ the Stevia, and we only get it from Global Sweet co., online. This is only co. in US makes it from the bark of birch trees, and not from corn or other sources. If it should turn out to be too thin, I just make a little paste of arrowroot, temper it with the hot mixture first, then add, stirring constantly to sauce mixture in pot and cook few minutes more. I worry about all these alcohol grain sweeteners (xylitol and mung bean sweeteners) as they are known to have a negative effect on the gut. I have seen this in my clients. Using small amounts of organic sweeteners (next time I might try coconut sugar or yacon syrup instead of brown sugar) isn’t as bad as other sweeteners on the market. Here’s a great recipe to use up some fresh garden veggies. An adjustable sauce that lets you be as sweet or mean as you like. 1. Heat half the Olive Oil (evoo) in a large saucepan or a Dutch oven over medium heat with a little coconut oil or ghee. Add the onion, scallions, garlic, fresh tomatoes, and red and yellow peppers. For a meaner sauce, add the jalapeño peppers; for the meanest sauce, add both the jalapeño and cayenne peppers. Sauté for 15 minutes. Remove from the heat and purée in a food processor fitted with a steel blade. Return to the saucepan. 2. Process the canned tomatoes with their liquid, the sugar, and remaining evoo in the food processor until smooth. Add to the saucepan. Stir in the chili powder, oregano, cloves, lime juice, Worcestershire sauce (or Tamari Sauce), red wine vinegar, and salt and pepper to taste. Simmer uncovered over low heat for 45 minutes. 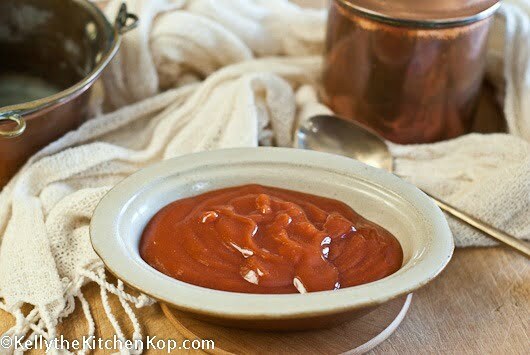 Monica C at Simply Being Well has some great recipes for condiments. Thank-you! My husband and I loved it…we used raw honey…sooo good.